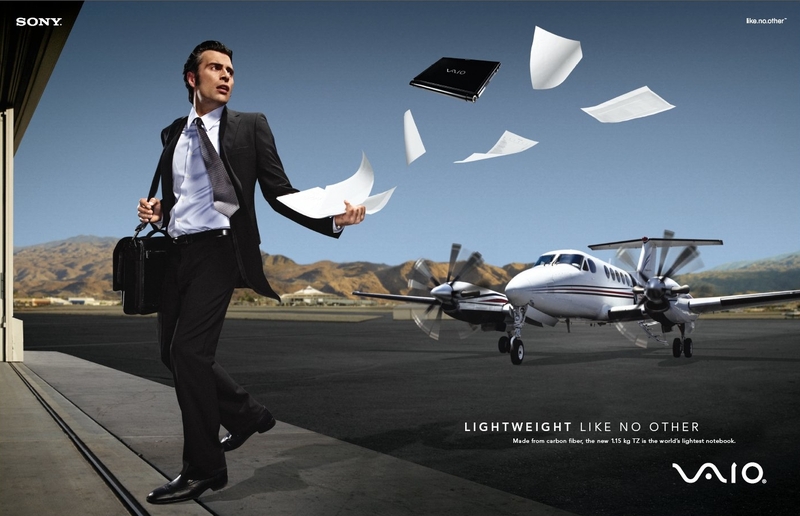 To introduce Sony's ultra light VAIO TZ, Los Angeles-based agency Ignited has taken the light-as-paper metaphor to heart with new print, outdoor and TV work, part of the brand's ongoing "Like No Other" campaign. While we're not sure we'd be fond of our laptop suddenly fluttering off in the wind or getting snagged and carried off by a flock of doves, we do think the metaphor is beautifully crafted. Besides, we still have faint memories of high school physics and realize that, even at 2.5 pounds, the TZ isn't likely to stay aloft for too long. The campaign has a decidedly international flair and for good reason. That's where the campaign is running. The work will appear in Mexico, Puerto Rico, Brazil, Argentina, Chile and the rest of Central and South America. The spot was shot by Brazilian director Bia Flecha of Brasileira Filmes and the print work was photographed by Pier Nicola D,amico, jnown for his work on Nike, Pepsi and ESPN.